No. 1 seed Seattle takes a commanding 2-0 lead into Talking Stick Resort Arena with a chance to advance to its first WNBA Finals since 2010. PHOENIX — Judging by its inability to sustain double-digit fourth quarter leads and comfortably close out Games 1 and 2 in the WNBA semifinals, it’s fair to wonder if the Storm can finish the best-of-five series with a sweep Friday night in Phoenix. On surface it’s an ideal situation, but the Storm has to face the No. 5 Mercury and star Diana Taurasi, who returns home after two sensational performances resulted in a pair of four-point wins for Seattle. 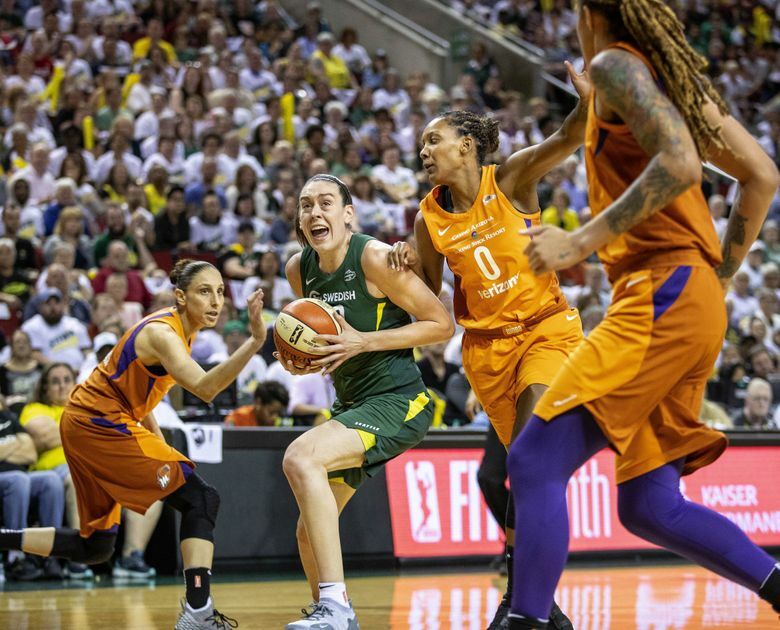 “You don’t want to give a team that has their back against the wall and knows they absolutely need to win … any hope or any confidence or any good feelings,” Storm guard Sue Bird said. “But that’s really hard to do in their home building. No one in the league is more dangerous than Taurasi, who is still salty the Mercury weren’t able to claim a win or two in Seattle this week. It’s not as if the 6-foot guard didn’t do her part. She’s been superb while scoring 25 points on 4-of-10 shooting in Game 1 on Sunday. She also had a brilliant 28-point outing Tuesday highlighted by an 11-point outburst in the final two minutes, including an improbable three-pointer with 3.6 seconds to force overtime. “We got some championship players,” Phoenix coach Sandy Brondello said. “No bigger than Diana Taurasi in these type of knockout situations. But we need the whole team and not just rely on Diana, Brittney (Griner) and DB (DeWanna Bonner). Phoenix’s Big Three (Taurasi, Griner and Bonner) combined for 69 points in Game 2 and 65 in Game 1. The trio accounts for 77 percent of the Mercury’s scoring. On Tuesday, backup forward Camille Little, a former Storm standout, gave the Mercury a defensive boost and was credited with holding league MVP Breanna Stewart to a combined four points in the fourth quarter and overtime. The Storm star finished with a game-high 27 points. Little had been an afterthought who played just two minutes in the previous three postseason games, but Phoenix plans to use a bigger lineup, including the 6-2 post. It’s a risky proposition considering Seattle is a high-scoring team that likes to run in transition and set the regular-season record for three-pointers. Postseason experience is a rare commodity among the Storm, which has four players who have won a league playoff series. To avoid a possible Game 4 on Sunday, the Storm will need to snap its seven-game streak of road playoff losses that dates back to 2011. “The first two games showed we have the talent, we have the team to play in the playoffs and we can pull off great spurts against a good team where we get big leads,” Bird said. “But that’s not enough. To win a series, you need to have that mindset of a killer that doesn’t let a team back into it.